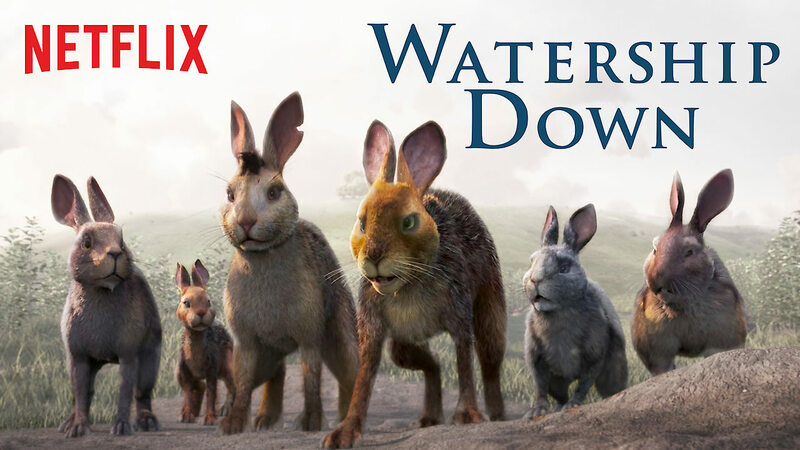 When I told one of my colleagues that I was watching a TV mini-series about a bunch of rabbits, she laugh at me saying “You’re watching a kid’s show on Netflix?” I replied that it was far from being a kid show. 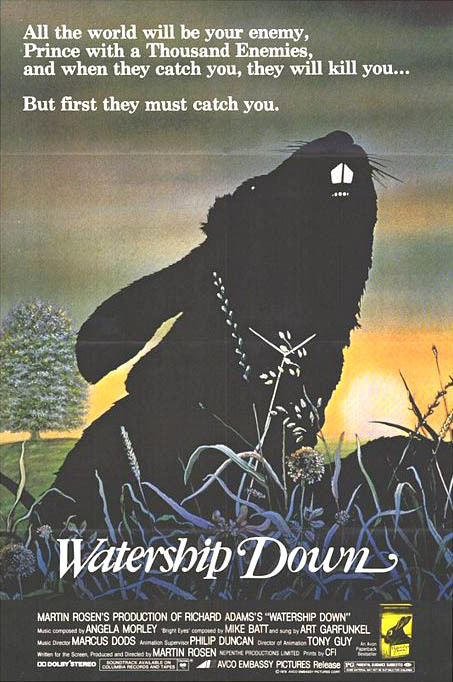 “Sure, it is about rabbits, but it is a very dark tale of survival”. This 2018 four-part TV mini-series tells the story of a group of rabbits who flee their warren and seek a new home. They are led by Hazel after his brother Fiver had a vision of destruction. Indeed, the sandy hill that was their home was invaded by bulldozers and backhoe excavators to create a new neighbourhood for humans. The journey is full of danger as rabbits in an open field can become prey to numerous predators (birds of prey, cats, dogs, foxes and… humans!). 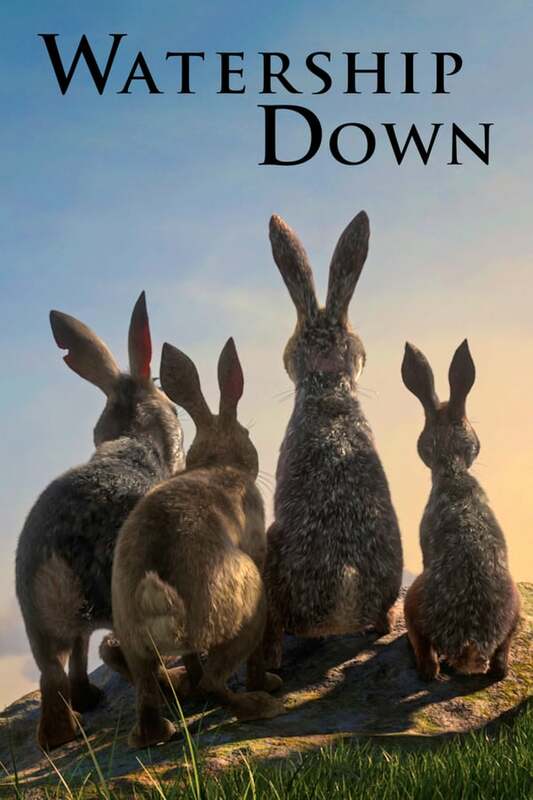 Before finding the ideal down (a gently rolling hill) to start anew, they will encounter two other rabbit communities which — having somehow lost their natural ways and surrendered their freedom in two opposite manners — will bring unimaginable perils to the group. I never read Richard Adams’ novel, but from what I’ve seen by browsing through it, the animated mini-series is a faithful adaptation. However, what I have seen, many years ago, it’s the 1978 animated movie adaptation by Martin Rosen (with John Hurt voicing Hazel). For the time it was a stunningly beautiful animation that was characterized by it’s strong graphic violence that made it clearly aimed at an adult audience. It became for me a sort of cult movie, proving that animation could be taken seriously by adults. Therefore, I was quite curious to see how this new TV series would fare in comparison and I was a little sceptical that it could be as good. In fact, after viewing the first episode of the mini-series, I was rather disappointed that none of the characters had died yet! However, after viewing the whole series, I am happy to see that it compares well with the movie. It even manages to update the adaptation for the twenty-first century (replacing traditional animation with 3D CGI and putting more emphasis on the ecological theme) while making the story more accessible to all audience by giving a more gentle version of it (with far less graphical violence). If it is far from being perfect, the 3D animation is nonetheless excellent. The animation of the rabbits, of the landscapes and the movements is all nearly perfect. However, the animation of the humans and of other animals (cats & dogs notably) really needed more work and is quite disappointing. The voice-acting is excellent and includes many great actors like James McAvoy (Hazel), Nicholas Hoult (Fiver), John Boyega (Bigwig), Ben Kingsley (General Woundwort), Tom Wilkinson (Threarah), Gemma Arterton (Clover), Peter Capaldi (Kehaar), Olivia Colman (Strawberry), Anne-Marie Duff (Hyzenthlay), Freddie Fox (Captain Holly), Miles Jupp (Blackberry), Daniel Kaluuya (Bluebell), Rosamund Pike (Black Rabbit), Daniel Rigby (Dandelion). However, it is not perfect. For example, as far as I remember, the voice of Kehaar (the seagull) sounded rather German in the movie whilst it was supposed to be Scandinavian. This time, it sounds Scottish (Capaldi)! It also feels strange that all rabbits from the same warren have different accents — but I guess it helps giving them different “personality”. What I found interesting is that Adams created a culture for the rabbits, a mythology (or at least a creation myth, based around the Sun-god Frith, the folk hero El-ahrairah [the Prince with a Thousand Enemies], and the Black Rabbit as death-figure), and almost a language (the Lapine, or at least a vocabulary that sounds foreign). It is fascinating as it grounds the story in reality, but also gives it the mystical aura of legends. Beside the very obvious ecological message (the Elils [rabbits’ natural enemies] kill by nature, by necessity and never more than needed, while men kill by pleasure, or simply because they can and will never stop “till they’ve spoil the earth”), to me Watership Down’s story feels like an allegory about the danger of totalitarianism (the later ’30s German fascism for example). However, Adams said that it was rather based on the theme of the classical hero inspired by the epics of Homer (Odyssey) or Virgil (Aeneid). All in all, it is beautiful, rich, riveting and intelligent. Well worth watching and highly recommended.